Cardiovascular, immune, and cholesterol support. 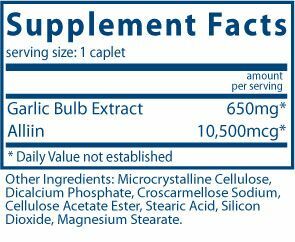 GARLIC 6000 helps the body maintain healthy cardiovascular function and helps maintain cholesterol levels that are already within the normal range. It also supports the immune system. Allicin is the active ingredient in garlic. The enteric coating helps to stop repeating and garlic breath odor. 1 caplet 1-2 times daily with food, or as directed by a healthcare practitioner. DO NOT CHEW. © Copyright 2019 Professional Supplement Center, LLC, 5441 Palmer Crossing Circle, Sarasota, FL 34233. All rights reserved. Local time is 4/24/2019 12:31:24 PM.